If I were a rich man... oh wait, that is from a different movie than I'm going to blog on - I am going to blog on Timeline. Not too far in the past I was asked to place my self in a time period and I chose the Middle Ages. This movie does a pretty good job of portraying the MA, but not nearly as well as Cadfael. 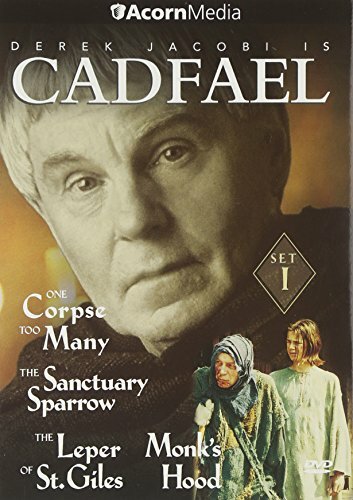 Cadfael novels I have previously blogged on, but the movies are in a genre all their own. If you have never seen them and have only devoted yourself to the books and already have a picture of Cadfael in your mind, you may not like them as much as I. However, it will not be for lack of acting. The great Derek Jacobi plays the monk and does a very good job at it I have to say. The time period is done well and all the rose colored glasses I so frequently put on when it comes to the Middle Ages are removed when I watch this series. How could people have lived in such a strange way? How could they have believed in such strange things as the power of bones? Lack of knowledge and lack of Scripture. What an amazing thing it must have been to those early reformation believers to actually get their hands on the real Bible - for the few that could afford it. What a magnificent difference the printing press made! We are in the midst of our Renaissance/Reformation study and there was *so* much change and upheaval during this time! If I could have been a fly on the wall of the German Reformation - ahh - what an event to watch unfold. SO much change in such a short time with so drastic a result! Wow - see what watching Middle Ages movies can do for a person? HA! Life this week has been something somewhere in between a comedy and a tragedy - not really so very dramatic as all that, but certainly a BUSY and slightly overwhelming week. Mom is coming this weekend and we plan on a lake walk. Time to get the house in shape, finish the never-ending mounds of laundry and make sure we do not have Fifth Disease. I think our Best Boy had this, but it is possible he didn't. He sure fit the bill though. I am just happy it is one of the lesser rashes! Childhood adventures! I say just squirt some canned Redi-whipped cream on that there scone and be done with it. Yum...Anne has the right idea. The Cadfael movies have me coveting. I found your blog over at Quiet Life (with Miz Booshay) and I really like what I've read so far! If you ever come to NYC, you should have tea in the Palm Court in the Plaza Hotel. I don't know if they have the real deal in cream, but they do a fabulous tea. I just love Derek Jacobi in anything he does, and I love Cadfael. We used to get it on the History Channel, and hubby and I watched it on friday nights, but it's gone now. I've tried to get my dd reading Cadfael because she's such a mystery buff, but nope. I love the Middle Ages, too. I am re-reading the Cadfael novels for at least the 5th time, while my 11 year old Moppet is reading them all for the first time! I love both the books and the movies...I was actually exposed to the movies first, seeing One Corpse Too Many on PBS. My one complaint with the films is that the original Hugh Beringar did not continue past the first season. I find something new to appreciate in these books every time I read them, and Ellis Peters' prose is sometimes so lovely and poetic. Needless to say, I was very, very thrilled to click over here and find this entry. Today on my blog I write a bit about one of my other favorite mystery series, which is set at the exact same time, in France. Caedfael is great. I don't know about clotted cream. must be an Anglophile thing. The name reminds me of blood clots. Yuck!